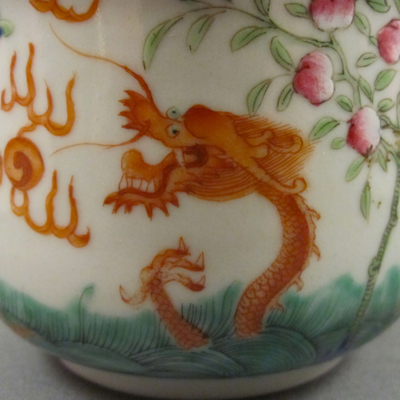 Last weekend I was traveling back from Southeast Asia and didn’t get the chance to wish you all a Happy New Year. 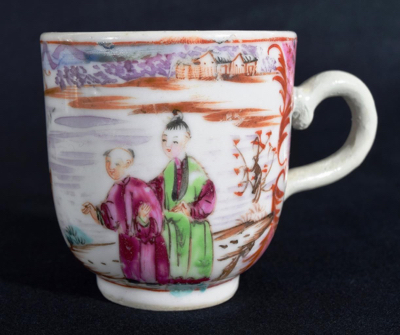 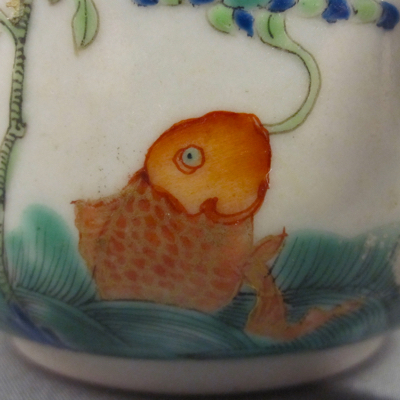 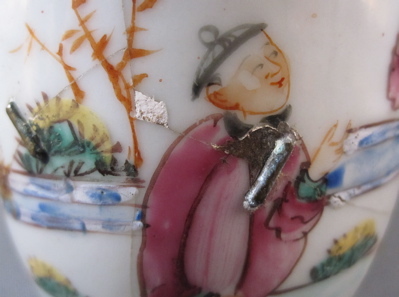 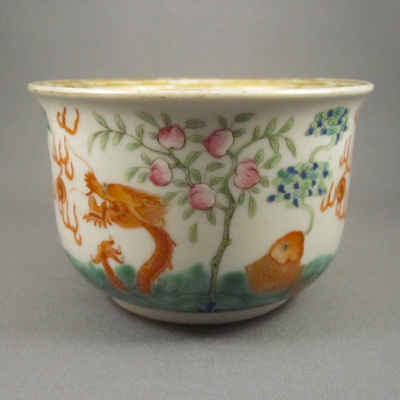 The image on this charming cup seems to be an appropriate way to welcome 2019, so Happy New Year…one week later! 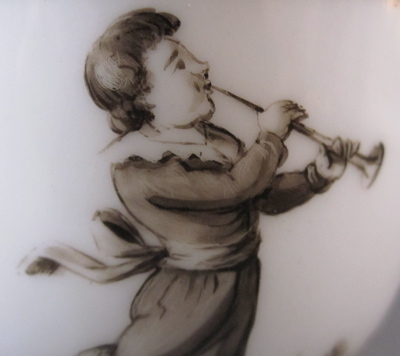 This porcelain Bute shape cup has hand painted decoration en grisaille (shades of gray) of a young boy tooting a horn. 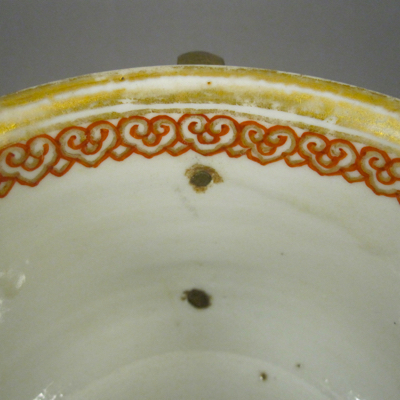 It has gilt bands around the rim and base. 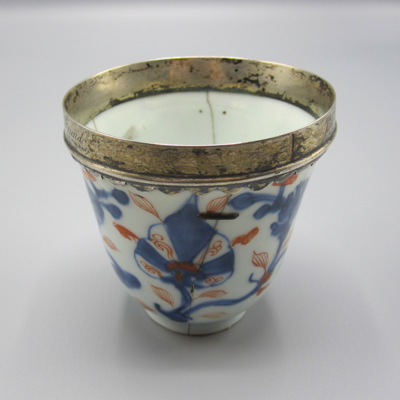 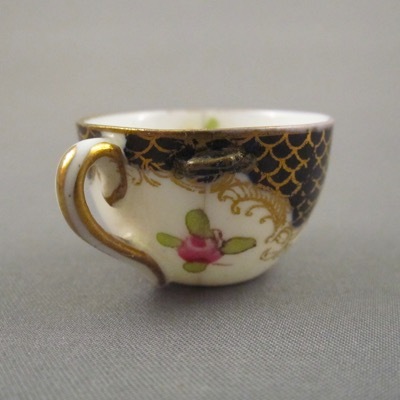 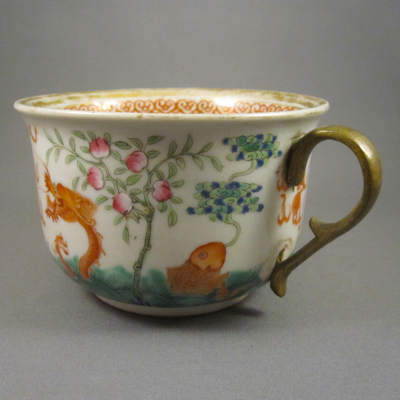 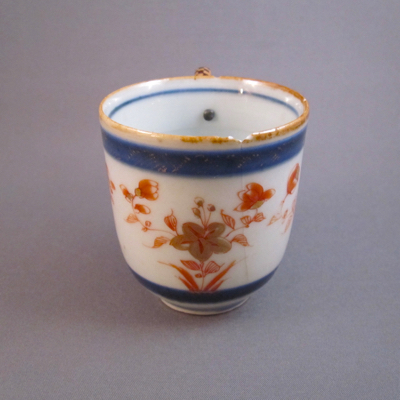 Cup measures 2.25 inches high, with an opening diameter of 3 inches. 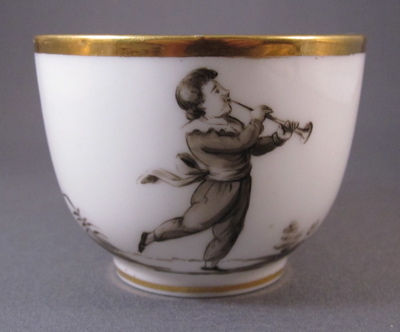 Much like a 1980s mullet – though a lot more attractive – this cup is business in front, party in the back. 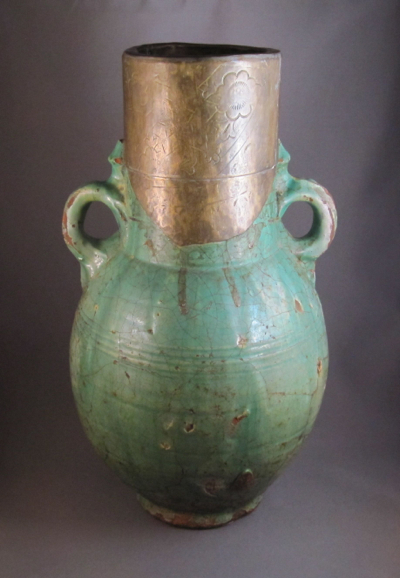 The bronze handle, which replaced the original broken one over 100 years ago, is unseen from the front but clearly visible from the side and back. 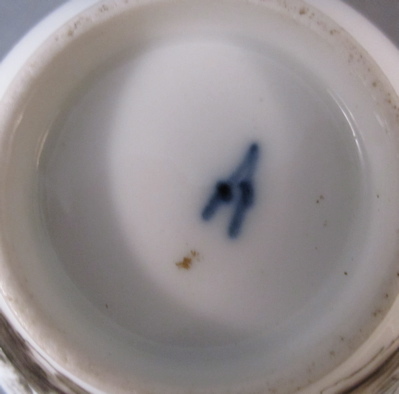 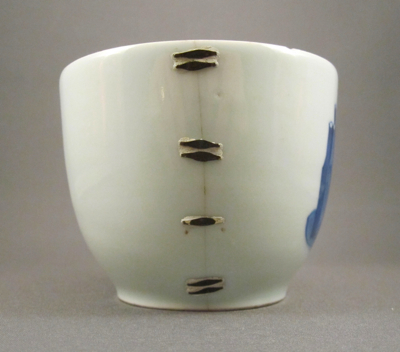 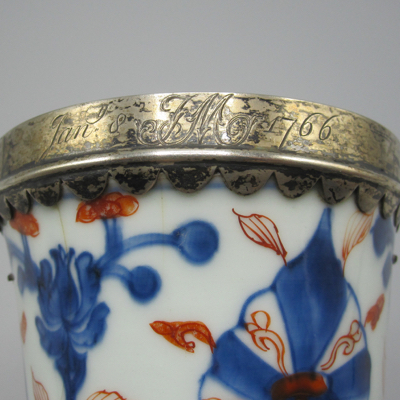 The underside has a cobalt blue mark, suggesting the cup is Continental or English. 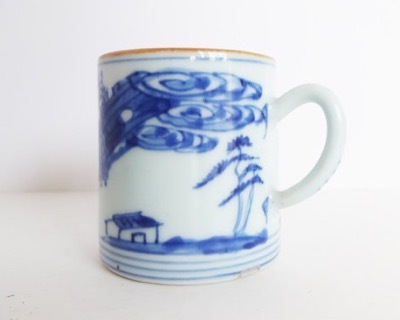 If anyone knows for sure, please let me know. 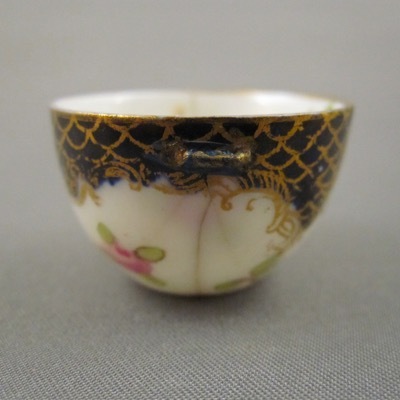 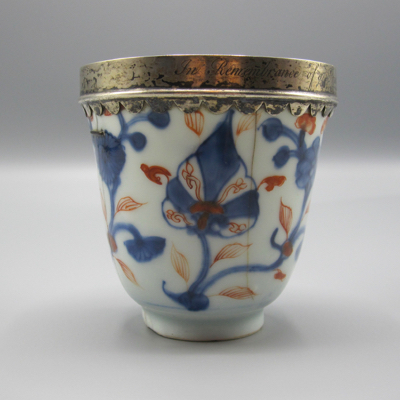 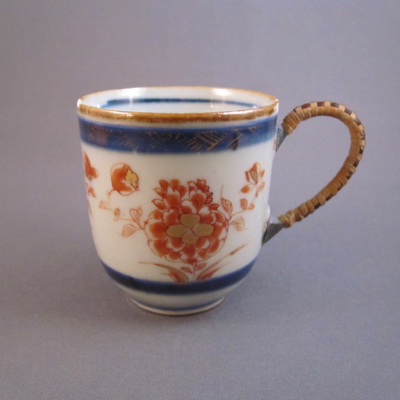 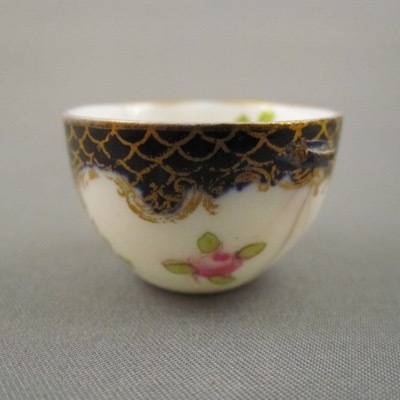 This petite porcelain tea cup has floral decoration in the Imari palette, including cobalt blue, red, and gold. 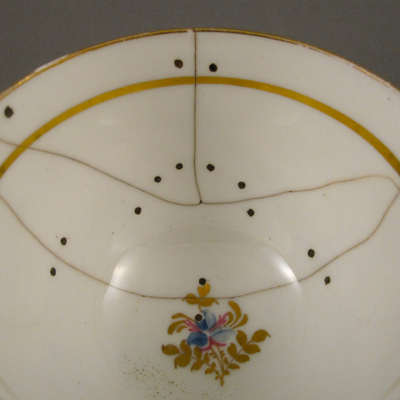 It was made in China during the Qianlong period (1736-95) and most likely would have been a part of a larger dinner service. 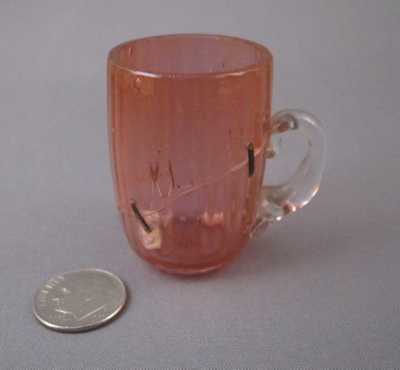 It measures 2.5 inches high. 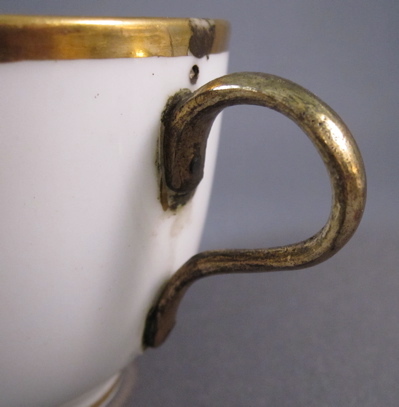 Well over 100 years ago, its original loop handle snapped off and was fitted with a nicely done, well proportioned metal replacement. 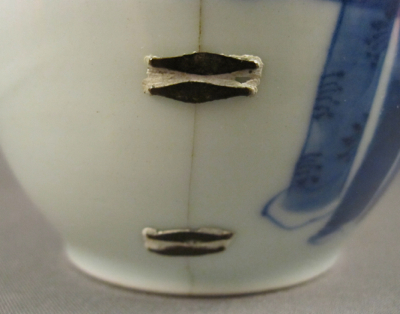 I especially like the two-tone checkerboard pattern of the woven rattan, which might have been the calling card of the repairer. 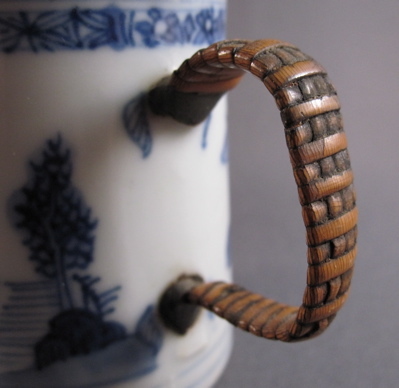 I have dozens of examples of wrapped metal handles and I like comparing the various styles and patterns of the rattan. 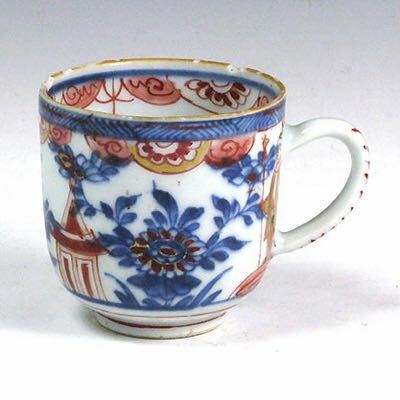 This cup with similar form and decoration suggests what the original handle on my cup would have looked like. 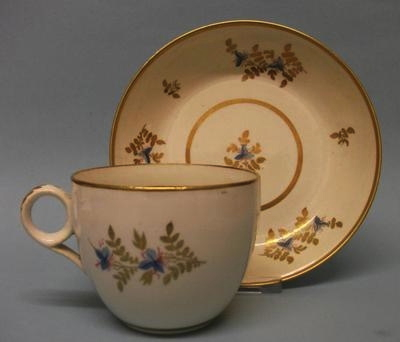 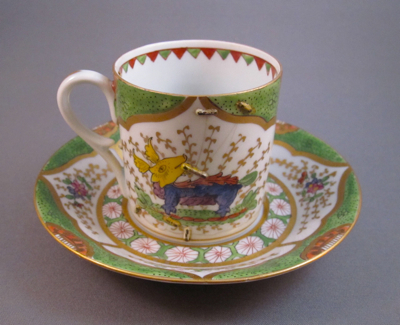 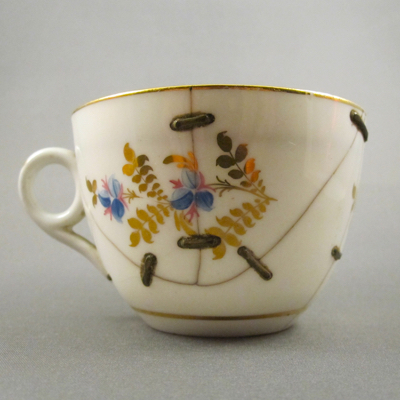 This bone china Bute shape tea cup is decorated with two-tone blue flowers, puce tendrils, gilt foliage and bands. 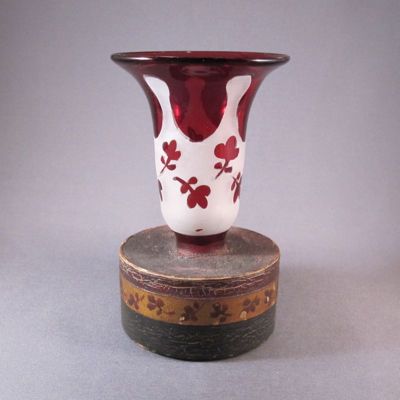 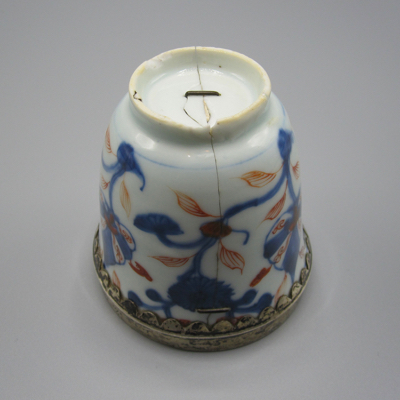 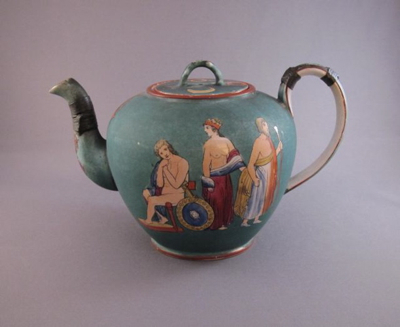 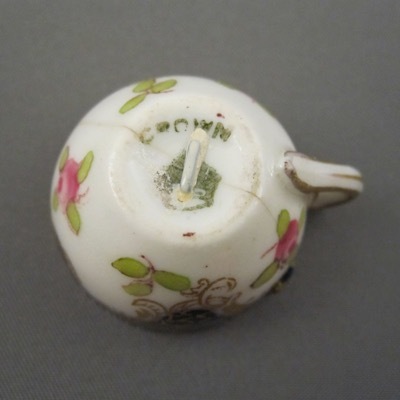 Measuring 2.25 inches high with an opening of 3.25 inches, it was made by Minton in Stoke-upon-Trent, Staffordshire, England, in the early 1800s. 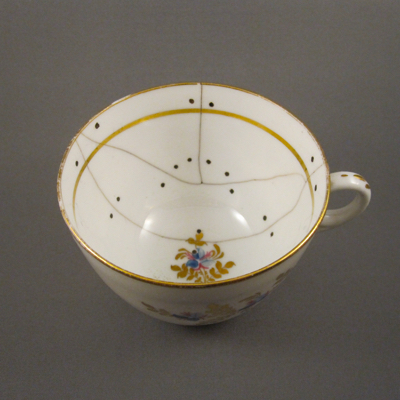 The Minton mark and pattern number 76 is handwritten in blue on the underside. 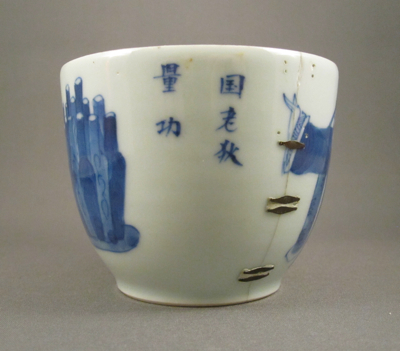 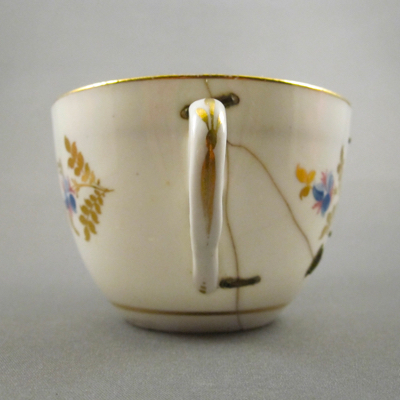 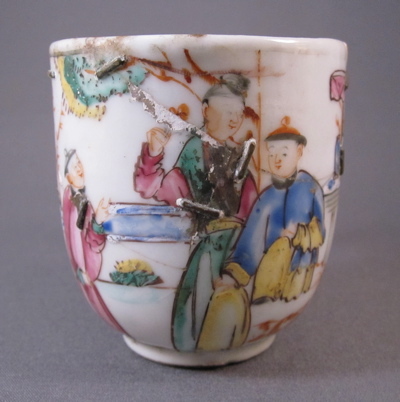 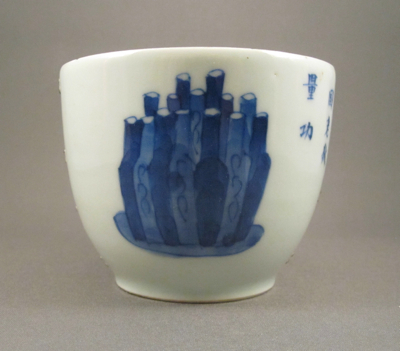 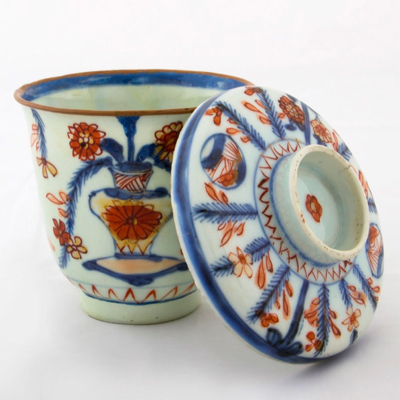 When this delicate cup slipped from the hands of a previous owner, unusual symmetrical breaks resulted. 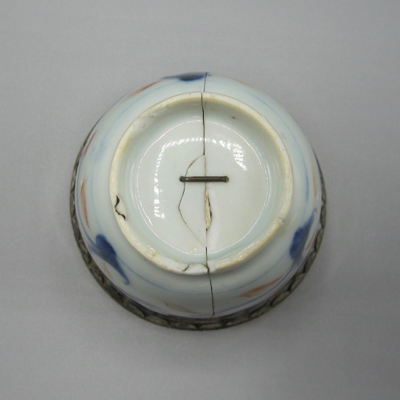 It was most likely reassembled by an itinerant china mender in the 1800s who used nine brass staples to put the four porcelain puzzle pieces back in place. 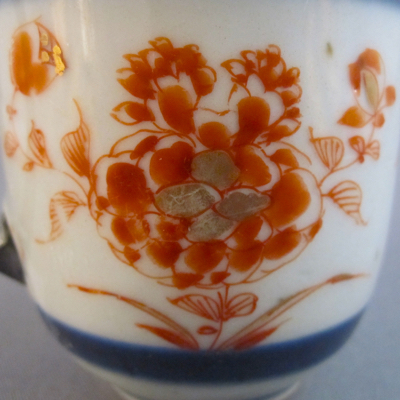 The integration of the staples, along with the existing floral motif, create an unexpected and exciting new pattern. 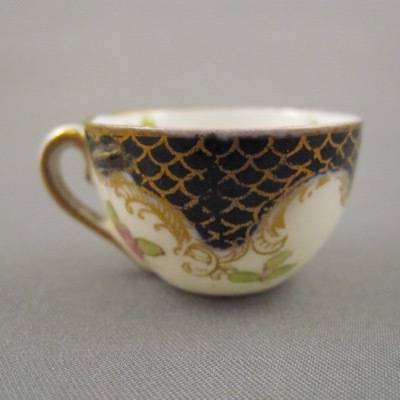 This tea cup with matching saucer is shown without staples. 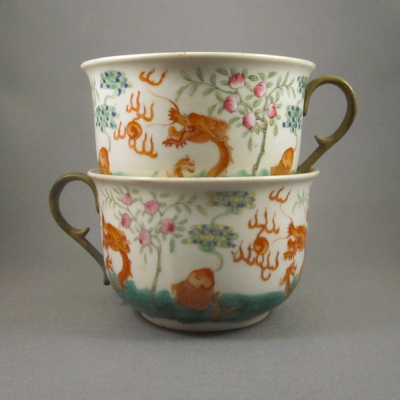 This pair of unmarked Chinese porcelain cups from the Guangxu period (1875-1908) are nicely decorated in the Famille Rose palette with peach trees, dragons chasing flaming pearls, and koi fish in waves. 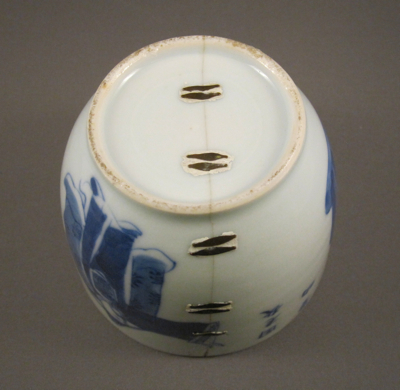 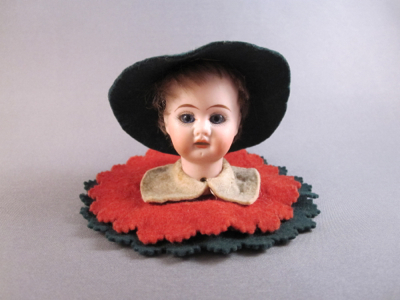 Each measures nearly 2.75 inches high and 4 inches in diameter. 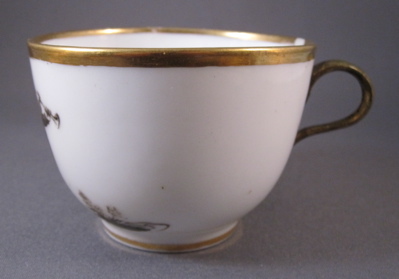 It’s hard to tell if the bronze handles, most likely added in the early 1900s, were replacement handles or if they were attached to transform handless bowls into drinking cups. 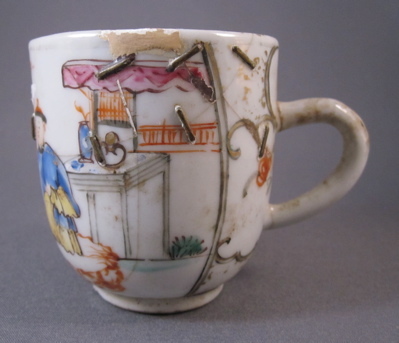 Finding pairs of inventive repairs is uncommon and I am always on the lookout for more examples. 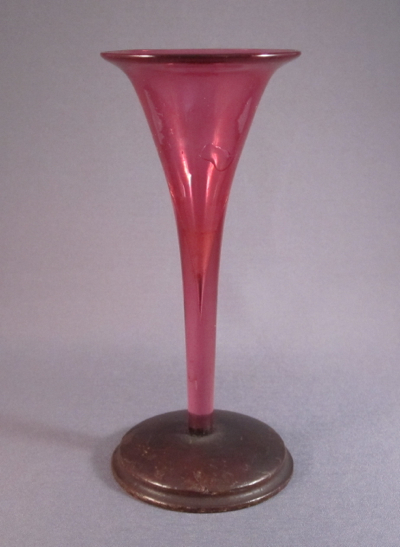 In the coming weeks I will show other pairs from my collection so stay tuned. 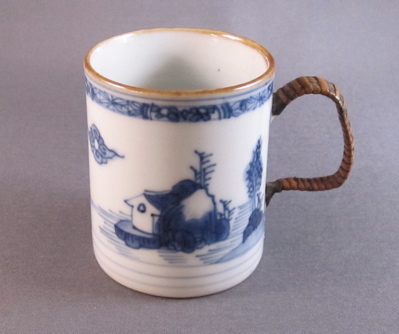 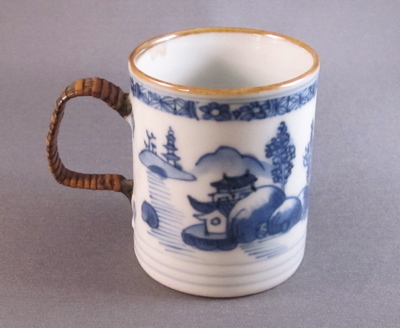 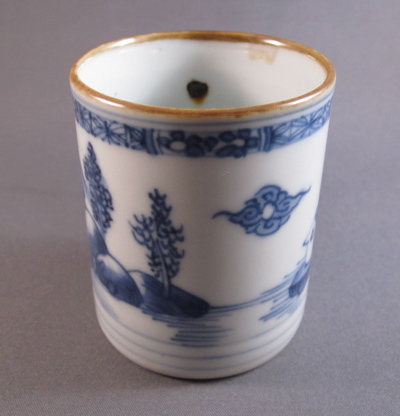 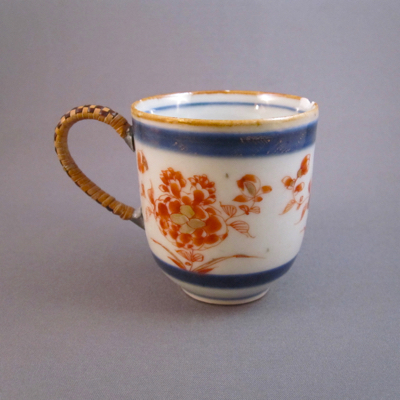 This cylindrical form porcelain coffee can (or coffee cup, outside of the UK) is decorated with cobalt blue underglaze decoration and has brown glaze along the rim. 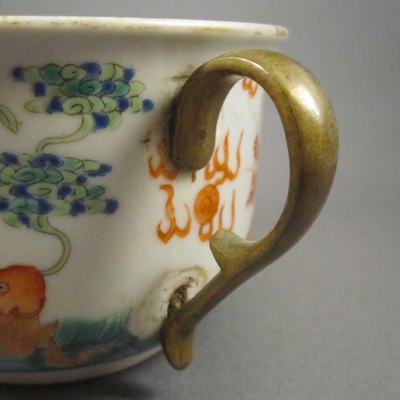 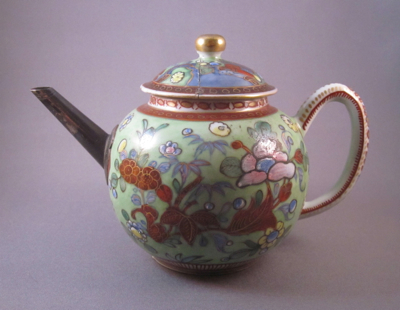 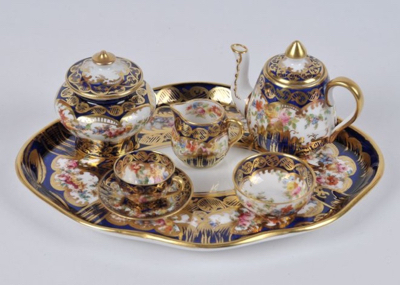 It was made in China during the Qianlong period (1711-1799) for export most likely to North America and Europe. 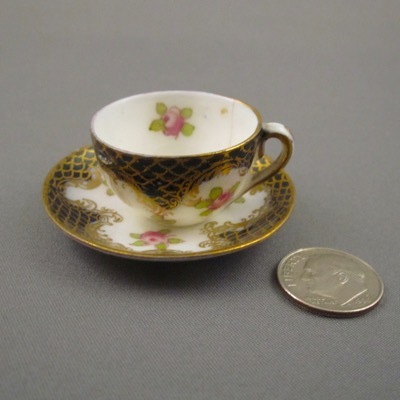 It measures 2.5 inches tall. 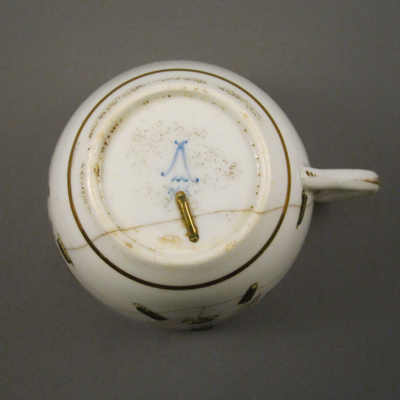 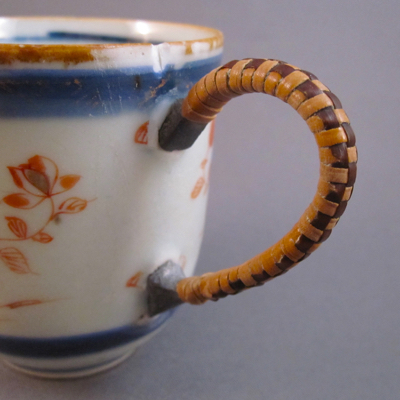 Well over one hundred years ago, this small cup slipped from someone’s grasp, resulting in its handle snapping off. 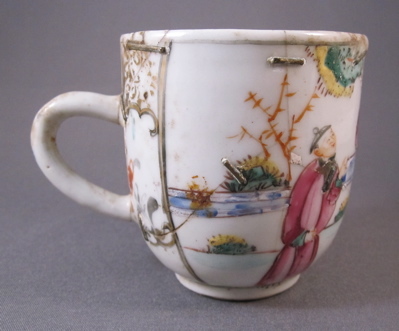 Rather than being tossed out, the precious cup was taken to a “china mender” who fashioned a sturdy iron replacement handle wrapped in rattan. 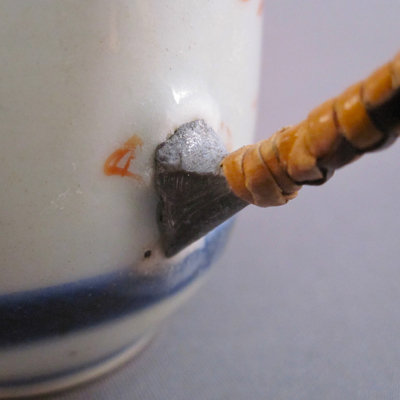 The woven rattan acts as an insulant from the hot contents and allows for a tighter grip. 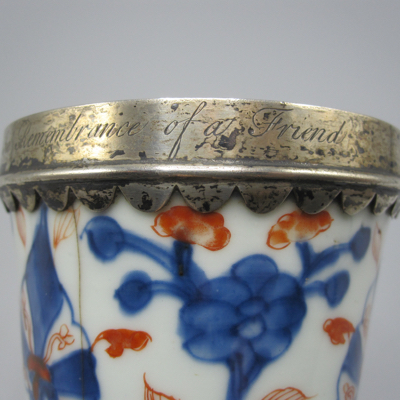 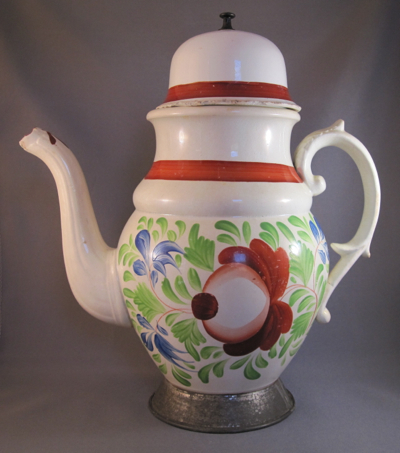 This coffee can with the same form and similar decoration shows what the original handle on mine might have looked like. 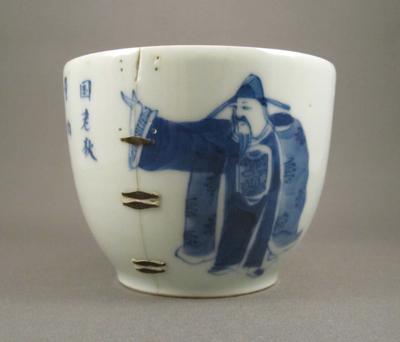 This Chinese porcelain cup is decorated in cobalt blue with a Peerless Hero figure, stacked bottles and calligraphy taken from Wu Shuang Pu (Table of Peerless Heroes), a late 17th century book of woodcut prints by Jin Guliang. 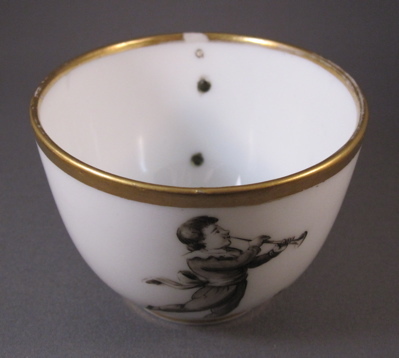 The cup measures 2-3/4 inches high, with an opening diameter of 3-1/2 inches. 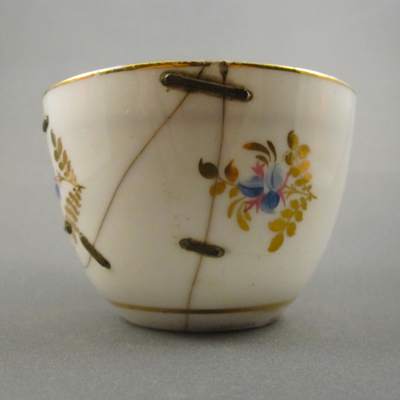 After the cup broke in half, over 100 years ago, it was repaired with pairs of metal staples set in cement. 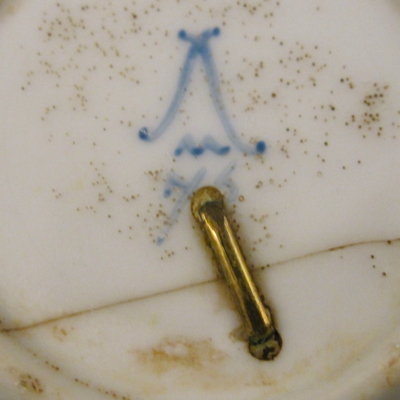 Judging from the flattened lozenge-shaped staples made from repurposed wire, this repair was most likely done in the Middle East where itinerant china menders set up shop directly in the streets. 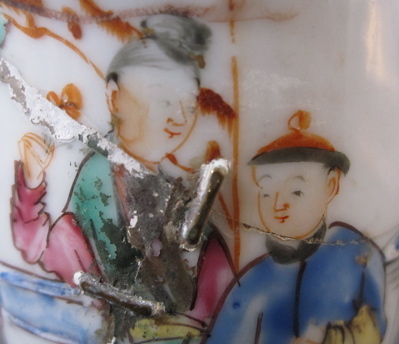 But even with the doubled up staples and binding cement, more than a few staples have jumped ship, leaving just tiny empty holes as a reminder of its time in the china mender’s hands. 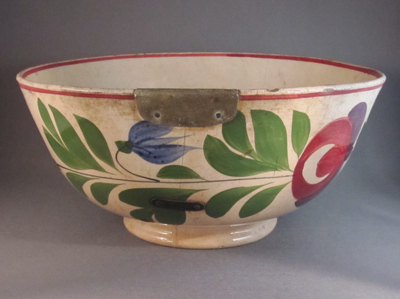 Wishing you all the best during the holiday season and for a healthy and Happy New Year!